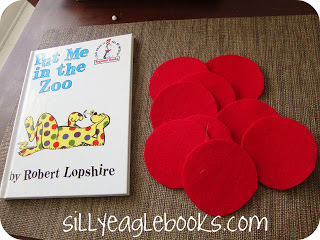 Feed Me Books Friday: Put me in the Zoo! 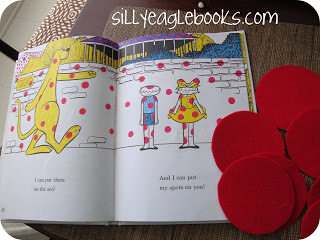 Put me in the Zoo by Robert Lopshire is a favorite book of mine from childhood that Juliet also loves to read with me. It’s one of those books we never seem to get tired of. 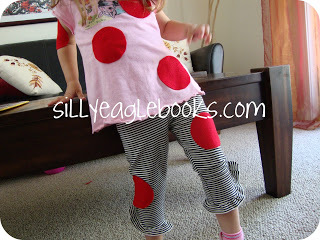 I had some red sticky back felt left over from another project that I thought would be great for making some spots for Juliet to wear one afternoon. 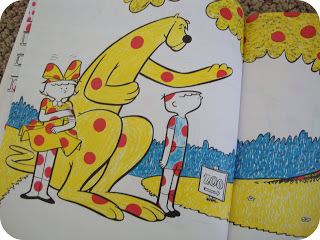 At one point in the book, “Spot” transfers his spots to the children. I thought we could pretend that part together. 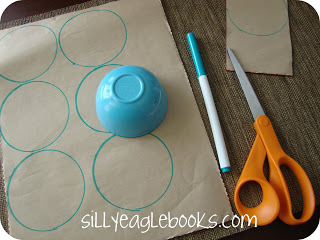 It was easy and fun, but here’s what I didn’t think about: the adhesive. It’s not really meant to be removable. In fact, I think the point of this felt is so that you don’t have to sew it onto projects, you can just stick it on. So….it was pretty darn sticky. I was afraid we would have a hard time pulling it off, (Have you removed a bandaid from a three-year-old lately? BABY TORTURE.) but it turned out to come off without any pain.There is a quote that we can say, “No pain, no gain”. It applies to every walk of our life. Financial walk too can never give you gains without any pain. Trading is one that fits this bill; you can never win completely without losing some. Click here to find out about one of the best binary trading platforms, that reduces your percent of pain, and increases gain. It came off the clothes, too, but left behind a lot of residue. Fortunately, I washed the clothes once and that took care of it–so no harm done, after all! However, I would warn you to NOT do this activity while your child is wearing his or her nicest outfits. Make sure they are wearing something old, preferably cotton. That’s what Juliet was wearing and I was able to wash all the residue off very easily. Comments Off on Feed Me Books Friday: Put me in the Zoo!